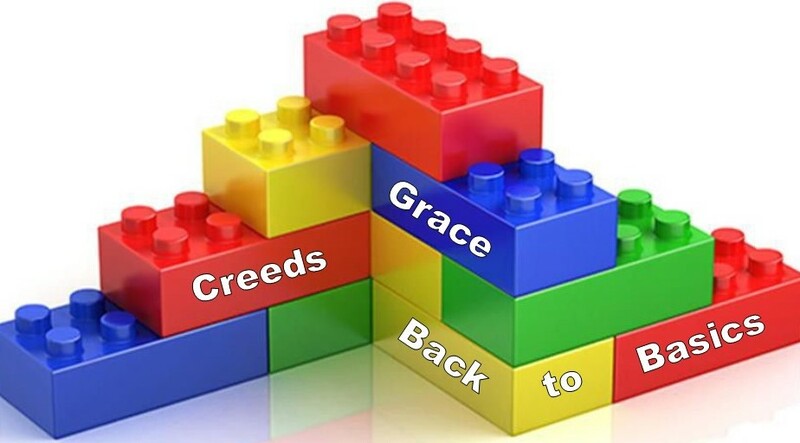 Last week we began getting “back to basics” by exploring the Apostles’ Creed. There are actually lots of Christian creeds. The scholar Jaroslav Pelikan has collected nearly a thousand of them. But the Apostles’ Creed and the Nicene Creed, and the rest of the 998 or so all express the same beliefs about God the Father, God the Son, God the Holy Spirit, the nature of the Church, forgiveness, and eternal life. Those basic beliefs are accepted by all Christians. But throughout history, different sects and denominations have had their own unique ways of living out those foundational beliefs. It makes me think of my husband’s fast-pitch softball team of 11-year-old girls. All fastpitch teams play the same game with the same basic set of rules. But each team plays the game a little differently, according to what their coach feels is the best strategy for winning. Like all Christians, we United Methodists claim the beliefs that are expressed in our creeds. But we focus on some things in ways that make us somewhat different from our brothers and sisters over at Community of Christ or Cedar Creek. Those are the basics we’ll be looking at over the next few weeks. God’s grace is constantly poured out on us throughout our lives. We are swimming in it, every moment. But God’s grace is multi-faceted, and we experience it in different ways as we make our way through our faith journey. We have words to describe these different aspects of grace. God’s grace is prevenient, it is justifying, and it is sanctifying. When we describe God’s grace as “prevenient,” we’re using a fancy word from Latin that means “going before.” Most of us aren’t born being conscious of our need for God’s forgiveness. We aren’t aware of how much we need God’s love and presence in our lives. But God knows. And God doesn’t ignore us until somehow we stumble upon the insight that we need God. Instead, God surrounds us with grace that is prevenient—undeserved goodness that goes before our ignorant selves and woos us until we recognize that we need God. Before we know God, God knows us and draws us ever closer until we see for ourselves what and who has been surrounding us all along. Max Lucado tells a story about a young girl named Christina, who longed to leave her poor rural Brazilian village for life in the big city. Her mother Marie’s heart was broken when, one morning, she realized that her daughter had left. She knew what life on the streets would mean for her daughter. And so, Maria quickly packed a bag and prepared to go find her. On her way to the bus station, she stopped to get one last thing. She found a photo booth, closed the curtain, and took as many pictures of herself as she could afford. On the back of each picture, she wrote a note. When she arrived in the city, Maria went to all the places where a young, poor run-away girl might end up: bars, hotels, nightclubs, any place with a reputation for street walkers or prostitutes. At each place she left her picture—on bathroom mirrors, hotel lobbies, community bulletin boards, corner phone booths. Soon she ran out of both money and pictures, and she had to return to her village, heart-broken and without her daughter. When we come to Jesus, offering him our sinful lives and our aching hearts, sharing our longing to be made right with God, we are forgiven through God’s grace and made right with God. This is called justification. God’s justifying grace changes our relationship with God; we are no longer servants but children of God. We know this because God’s justifying grace carries with it the blessing of assurance—the heart-deep knowledge that God loves us and, through our faith in Jesus, has forgiven our sins. John Wesley had been a priest and missionary in the Anglican Church for nearly ten years before he experienced God’s justifying grace. He served God, but he questioned whether his faith was a true faith. He knew that something was lacking in his relationship with God; he felt that hole in his heart. During a terrible storm at sea, he realized that he was afraid to die, and he recognized that as a lack of trust and faith in God. He was a fearful servant of God, not a trusting child of God. You might remember that when I came to Zion, Marc and I were in the process of renovating our house. The project began the day we signed the contract for the work, but it was several years before we were, well, mostly finished. As much as we’ve accomplished, there is still more to be done. Our sanctification is a life-long renovation project, one that may take right up until our dying day. But God’s gift to us is the sanctifying grace that gives us the power to live in new ways, and we are accompanied by that grace until the day when we are perfected in love. In Paul’s letter to the Ephesians, he speaks of how God’s grace accomplishes the work of saving us from the lives we once lived for the life God has planned for us—a life of eternal relationship with God. Paul reminds the Ephesians, and us, of what life without Jesus is like—following the ways of a world that doesn’t love us and has its own interests at heart, having our minds set on earthly things rather than divine things, trying to fill the empty places of our souls with things that don’t satisfy us, because the only thing that can fill that God-shaped hole in our hearts is God. Paul’s words about God’s prevenient, justifying grace are beautiful and hope-filled: “God, who is rich in mercy, out of the great love with which he loved us, even when we were dead through our trespasses, made us alive together with Christ—by grace you have been saved. . .” Then, Paul speaks of that life which God’s sanctifying grace makes possible—the life for which God has made us, a life of good works that reflect the faith we’ve been given, and the way of life that God has prepared for us. What is grace—prevenient, justifying, sanctifying grace? It’s a gift from God. It’s “God’s “bounty… or free, undeserved favor.” It’s “the undeserved, unmerited, and loving action of God in human existence through the ever-present Holy Spirit.” It’s undeserved goodness. However we define it, we experience it throughout our lives as God’s surrounding, saving, empowering gift. Thanks be to God for the blessing of amazing grace. Amen.